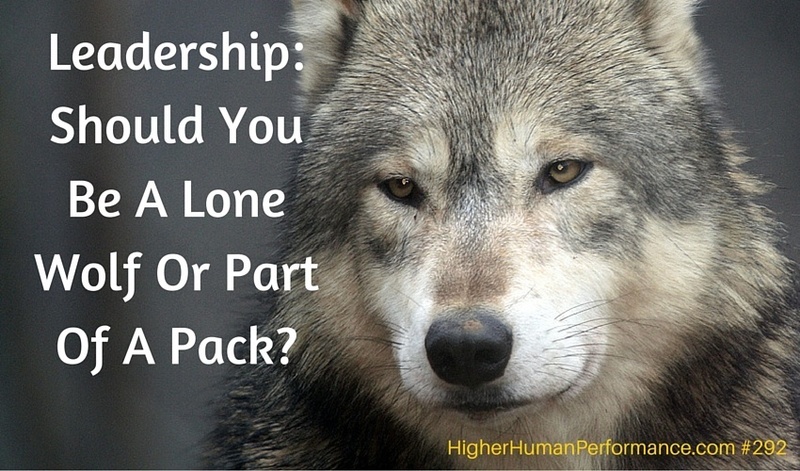 292 Leadership: Should You Be A Lone Wolf Or Part Of A Pack? Leaders, like followers, come in a variety of personalities, styles, philosophies, tendencies, experiences and aptitudes. Too many variables to lump people into simple, easy categories. People grow, adapt and change, too. I’m not quite the same leader I am today as I was a few decades ago. Truth is, I’ve made some significant changes (improvements) in the last 5 years. In some respects, I don’t think I resemble the leader I once was. It’s called growth and learning! Professionally, it’s what I work diligently to help other leaders experience, too. It’s not always the most comfortable process. Rarely does growth or improvement happen without stress. You can either lean into it or run away from it. Flee or fight instincts often overrule our sensibilities. A true leader learns to behave intentionally and run toward the fear where growth is found. Cowards feel trapped, acting like they’re in a mine field. Afraid to move a single step in any direction, they freeze. Of course, the problem is…you can’t live in a mine field. Remain stationary and you die. Make a move and it might kill you, but you might find your way out. There’s no avoiding risk if you’re chasing reward. Leadership is a reward. It’s for the courageous and brave, not the fearless. Every leader I’ve ever known admitted being afraid of something. Often times, many things. Fear doesn’t define leadership, but our response to fear often does. Enter hubris. It’s too common to find leaders who are fearful of showing fear. Vulnerability isn’t a quality they think belongs on any list of leadership. Foolish. Wrong-headed. Some leaders let fear drive them into a lonely corner feeling they must fight the fight alone. Survival of the fittest and all that. “Never let ’em see you sweat.” “Show no signs of weakness.” All that other bravado that often drives leaders. Especially the loneliest ones. “Nobody understands what I’m going through anyway,” he says to me. “How can you be so sure?” I ask. “Because my problems are unique to our organization,” he says confidently. My work consists primarily of asking questions. It’s how clarity happens. Asking and answering questions foster clear thinking and bring things into sharper focus. At least that’s the goal. He starts to think. And think some more. Then he summons up the courage to mention an industry specific issue, but quickly realizes it’s just details. The jest of the issue isn’t uncommon and he knows it. Slowly a smile begins to show through and he meekly admits that he doubts he’s alone. “Then why are you trying to go it alone?” I ask. That sparks the conversation I’ve been wanting to have with him. He’s a CEO with very capable COO. For reasons I don’t fully understand, he doesn’t have a relationship with the COO that seems healthy to me. I mean he trusts his COO. The man is very capable, even strong. They get along just fine. There’s no apparent trust issues or personality conflicts. It’s communication. The CEO doesn’t freely share information with the COO. And it’s not out of any apparent sense of hoarding information. At first I suspected it was simply the CEO’s “hold your cards close to your vest” style. But it’s more than that. My intuition has been prompting me to dig deeper for months now. I’ve resisted digging in lieu of closer observation to see what behavior shows me. Sure enough, it’s more than obvious that the COO is frustrated at a professional life relegated to trying to figure out what his boss is thinking, feeling or wanting. The CEO senses the frustration, but figures it’s just how things roll. As I work with both men I know how valuable candid conversations between the two men can put them into a brand new, higher orbit of effectiveness. Mostly, I’m feeling a bit sad for the CEO who is bent on “going it alone” because it’s just how he thinks things ought to be. I’m also sad for the COO, a bit younger than the CEO, because he’s being robbed of the opportunity to grow and learn at the hands of a man he deeply respects. Both men are losing out. Fast forward past numerous conversations and what seem like thousands of questions. The CEO fears putting a burden on his COO that is undeserved. “He’s not paid or tasked to worry at my level,” he divulges one day. “So that’s why you don’t let him into your world as closely as you could?” I ask. “Sure, of course. The buck doesn’t stop with him. It’s stops with ME,” he says – as though he’s stating an unarguable fact. What ensues is a discussion about how people grow, especially our children. The CEO, a father, can relate. The kids are grown now. I ask him if the things he shared with his kids changed as they grew older. Of course it did. As they grew up and matured, he and his wife were able to share more and more with their kids. With their experience and maturity, the kids were not only capable of handling more, but they craved it. It deepened their relationship. He easily recognized it when the context was his own children. I then morphed the conversation to the professional “children” in his life – those people he loved and served – and who wanted to serve him. He was their leader. The place had high regard for his professional prowess. The whole organization reeked with desire to please him. He’d started this business. The founding father was viewed with the regard he deserved. I thought he deserved to not fly alone when he had people, especially one very close executive, fully capable (and desirous) of being a confidant. I sat there telling stories of growth, improvement, sharing confidences and having a person with whom he could “shell it all down.” Over time it was apparent he had a yearning for it, but he had been a lone wolf for a long time. Habitual loneliness isn’t so easy to abandon. Sometimes investments are difficult. Nothing ventured, nothing gained. The CEO didn’t necessarily want to be a lone wolf. He just assumed that he had to be. That it was unfair to go any other way. Smart people can make bad assumptions. They can also figure it out and alter their course. A CEO with a COO who is his right hand, and confidant is a very different man than a guy living in a cave fearful of sharing his issues and worries fully. Proof that old maxim is right, fear is False Evidence Appearing Real. Rip it down, tear it up and mostly our fears are without foundation. When the two men sat down for a candid conversation – far more candid than any they had ever had – it’s powerful. It’s not about business issues. It’s not about the quarterly performance. It’s about their feelings and inner desires to be better men, better leaders and together – to build a stronger organization. I warn them that they may both feel regret over what’s been lost, but I challenge them instead to rejoice in what’s found. These are the moments I live for. Major breakthroughs. We’re all wired a certain way. Thankfully, the CEO was wired to accept the challenge to help spur on his own growth, and the growth of his COO. Together, they sparked a pretty major growth in their company. The culture shifted from practicing communication that was often ambiguous and vague to being candid, open and forthright. You could feel it on your skin like a warm blanket on a cold night. It was comfortable. Nice. Many stories don’t have happy endings though. Sometimes a lone wolf is alone refusing to go it any other way. They want to be alone. I no longer care why. I once did. I’d anguish about why a person would be so bent. Through the years I’ve found it foolish on my part to try to connect those dots. For a lifelong dot connector it’s vexing, but even a hard head like me learns to cry “Uncle” when I’m beaten. Arrogance. Hubris. Ignorance. Stupidity. It really doesn’t matter why. I just learned to make a distinction between those who want to and those who simply don’t know how to do it any other way. At first glance it can tough to tell, but hang with it long enough, ask enough questions and pay close attention long enough — and it becomes pretty clear which it is. Is it desire? Or is it lack of know-how? Sometimes I still try to convert the willful lone wolf. Mostly I focus on the value lost. Their own value. Yes, I appeal to their selfishness, working to convince them of what they’re costing themselves. Then, I shift it to what they’re robbing their own team of – the chance for personal and professional growth and development. Perhaps if I were better I’d win more of those battles than not, but I’m not in control of it. I can only present people with the value proposition and the risk proposal. Each of us are free to roll the way we want. I honor that. I try to respect it, but that’s infinitely harder. What I do respect is our ability to make our own choices. Maybe if we look at animals in the wild we can gain some clues about this whole lone wolf thing. Young animals need protection. They also need to learn the skills necessary to fend for themselves. The herd, pack or flock needs to perpetuate itself. That means the young, inexperienced members need to grow, develop and eventually reproduce. Even the most dominate leader of the pack needs the pack. Without them, he can’t survive long. When a beast grows old, feeble or is injured – then the drag on the group is obvious. That’s when you see him wonder off alone. To die. We may impose our human emotions on such a situation, but it’s easy to see the practical realities of it. The group can’t be put at risk. There comes a time to cut and run it alone. Survival isn’t possible. It’s just a matter of time. Go it alone and avoid risk or injury to the group, or be stubborn, remain with the group and put them all at risk. If you’re dying, go it alone. Please. For the sake of others, reduce or eliminate the risks to others. But if you’re determined to grow, you’re crazy for going it alone. You may not make it to full maturity. Predators might kill you. You may fall into some trouble that you never saw coming. All because you were just too stubborn to be taught. Too stubborn to allow somebody else to show you a thing or two. Just because you can go it alone doesn’t mean you should. We tend to think that because we’re able to drive a car, and because we’ve got our driver’s license — we can handle anything the road or traffic throw our way. Wrong! Inexperienced drivers die on the roads in America daily. Unaware of the dangers they think that because they can drive a car, that they’ll be able to handle anything that happens while driving. In too many cases it’s a fatal error. Business owners, executives and leaders fall into the same trap. Sure, they have the ability to do as they please and go it alone. That doesn’t mean it’s wise. Fools go out of business all the time. Executives blow up their teams and their careers just as frequently. It’s up to us to decide what we want to do: grow or die? The group matters. Who you listen to matters. Your decisions matter. Your judgments and choices matter. It’s important to know where people are coming from and to whom they’re beholden. Leaders often tell me about their “trusted advisors.” Sometimes I’m shocked at how much trust and confidence people put in others who clearly have a vested interest in one outcome or decision versus another one. It may not be so easy to see when it’s YOU, being the leader who is leaning on a close friend, or some service professional, or an employee. I’m not saying trusted advisors can’t be trusted. I’m saying we all need to be realistic about the level of trust we put into somebody based on their own interests. There’s nothing wrong with trusting people. I rather think leaders should likely be more trusting, not less. However, we have to acknowledge that each of us have a vested interest in an outcome the closer we are to the outcome. In other words, when a CEO is considering an important decision she may summons her inner circle for feedback. She should. She should also remember that these people work for her and they want to please her. They have jobs and duties to protect. They may not be as forthcoming in giving an honest counter position to a proposal she offers because of that. Likewise with a service professional like an attorney, accountant or insurance person. These people want to continue to our provider of choice. They’re going to do everything in their power to keep us happy. It has nothing to do with honesty or integrity. It’s just how things go. Decisions and choices are often jaded by personal interests. The US Government is the best illustration I can offer you. Special interest lobbyists drive the system. I scratch your back, you scratch mine. It doesn’t often produce the very best outcome because the drivers behind the decisions aren’t often made from a strong position of clarity. There are biases built in all throughout the system. That means it’s important for leaders to surround themselves with people who can serve them without any penalties. People who care enough about the leader — people who have the skills and experience to help — people willing to offer tough questions — and perhaps even tougher suggestions — all because they want the leader to grow, excel and improve. Very few leaders have such a group. Most have never experienced such a group and may tend to believe that such groups aren’t even possible. Through the years I’ve heard a number of top executives lament that life at the top is just what it is. Of all the problems they face, this seems to be the one problem for which they think there is no solution. It’s a myth. The answer to the question is simple if you’re dying. Go it alone. Please don’t cause the death of others. Let the rest get out alive if possible. If you’re growing, then you have no choice, but to join yourself and align yourself to others who can serve you, and who can be served by you. That includes an inner circle. Maybe it’s a right-hand man, like the CEO and the COO. Share the burden of leadership with others who are part of your executive team. Like the youngest members of the pack, they can best learn when you’re willing to teach them. And they’ll serve you in return. But you need more. You need people capable of knowing where you’re coming from. You need peers. That’s the biggest frustration often expressed by leaders. They think they have nobody with whom they can share because nobody in their life can relate to their situation. Mostly, they’re right. But not entirely. Some have tried mastermind groups, but found them wanting. High performing leaders can find themselves in a group where their expertise is benefiting others, but they leave with a rather empty experience for their own issues. Sometimes groups are grossly out of sync where the disparity is so large members can’t quite relate to each other’s situation. Inevitably, the weakest members of such groups tend to establish a baseline of performance that just isn’t high enough for the people who really want to soar much, much higher. We don’t need a group that will weigh us down. We need a group that will lift us up. We need a group that will encourage us to stretch, push and strive to grow and improve. Here’s the sad reality — very few leaders have experienced a truly helpful group with no axe to grind and no dog in the hunt other than to help, encourage and serve. Yet we’ve likely experienced a taste of it with our family or some other small group. People who surround us and tell us, “We’ll help you. You can get through this. We understand what you’re going through and we’re here for you.” Nothing in return other than knowing they can help, and knowing that when they need help, you’ll do the same for them. So you can decide for yourself how you’ll go. Clearly, I’m hoping you’ll decide to join a pack. Whether that pack is a small, intimate group or something else you think is high value, you decide. Just don’t go it alone. Because you only go it alone when you’re ready to go off and die!